Hampton Court Castle, Gardens & Parkland01568 797777work Historic HouseThe wonderful 15th century Hampton Court Castle and its award winning gardens is situated in Hope-under-Dinmore between Hereford and Leominster It is surrounded by acres of stunning parkland, pasture and woodlands with the River Lugg running alongside. Children will have a fabulous day getting lost in the maze, discovering the secret tunnel, getting wet behind the waterfall, swinging on our zip wire or climbing around our children’s play area. We are proud to say that Herefordshire’s Hampton Court Castle predates Hampton Court Palace by some 80 years. The land was granted by King Henry IV to Sir Rowland Lenthall at the time of his marriage to Margaret Fitzalan, daughter of the Earl of Arundel, a cousin of the King. Lenthall built the original quadrangular manor house in 1427, 12 years after his Knighthood at the battle of Agincourt (1415). In 1434 he was granted licence to crenellate the house by King Henry VI. The journey the Castle has had since that time is interesting. Hampton Court Castle can be hired for weddings, private functions and corporate events. Due to the risk to fragile interiors, flowers and our on-going Environmental Protection Scheme, we regret that dogs are not permitted in any areas of the Estate including the car park. The wonderful 15th century Hampton Court Castle and its award winning gardens is situated in Hope-under-Dinmore between Hereford and Leominster It is surrounded by acres of stunning parkland, pasture and woodlands with the River Lugg running alongside. Assistance dogs: Dogs assisting visitors with disabilities are welcome inside the castle, gardens, café, shops and on the river walks. The Gardens are open from 10.30am to 5pm every day until 16th September and then again from 27th October to 4th November 2018. 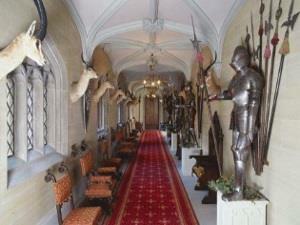 Castle Tours may not be available if the castle is in use for a private function eg. Wedding. Please call the Ticket Office before visiting 01568 797777.